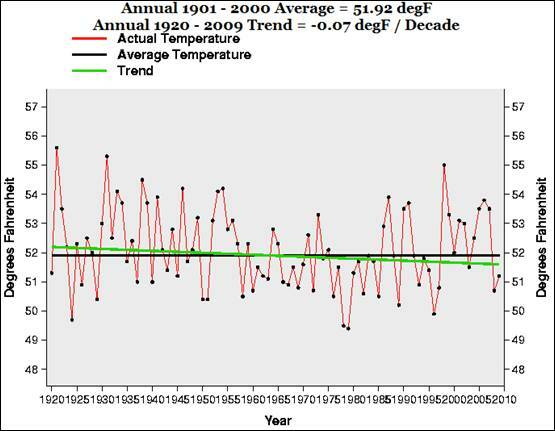 The following figure shows average annual temperature in Illinois for 1920-2009 (plotted at the NOAA NCDC website: http://www.ncdc.noaa.gov/oa/climate/research/cag3/state.html) No warming. Science Advisor, John Holdren: “Lessening our global dependence on fossil fuels and increasing energy production from renewable resources is vital in reducing the harmful effects of climate change, said Holdren. … “It’s [global warming] actually lulled people into a degree of complacency about this problem,” Holdren said, calling the term a “dangerous misnomer.” Climate data on increases in floods, droughts, heat waves, pest outbreaks, typhoons and hurricanes of the largest categories, among several factors, show the pattern of what is actually happening to the Earth— not just what you would expect to happen if global climate change was the cause, said Holdren.” (from the Northwestern University Medill School report “Global warming picking up steam, Obama top science adviser says” 2010/04/28. [http://news.medill.northwestern.edu/chicago/news.aspx?id=163838]) Too bad he ignores the data showing what is actually happening. 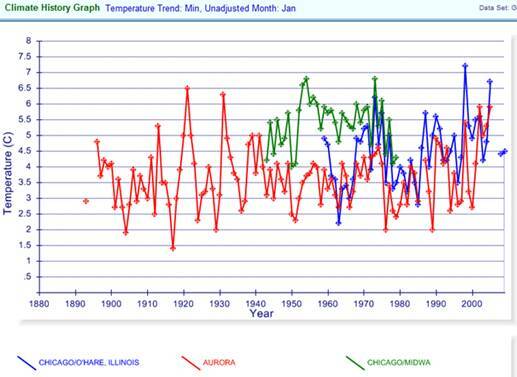 The following figure shows the January average minimum temperature for the same three Chicago area stations. 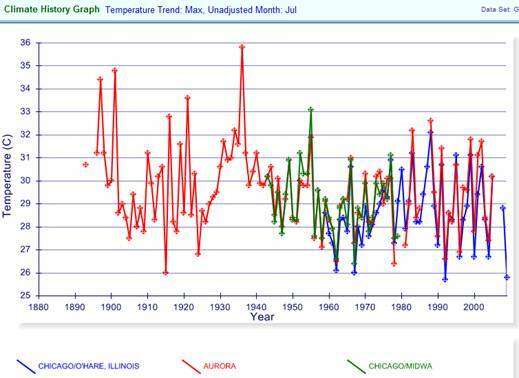 Over the last 100 years Chicago summer maximum temperature has been declining while winter minimum temperature has been increasing. That would seem to be a positive impact of global warming. They present the following figure as the expected future due to increased CO2. 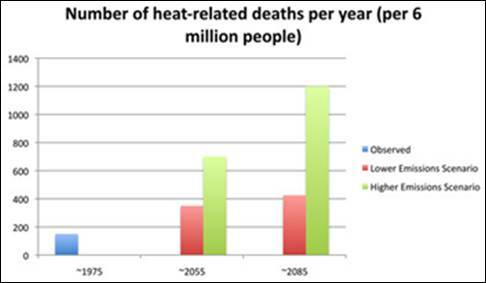 They mention a deadly July 1995 heat wave. 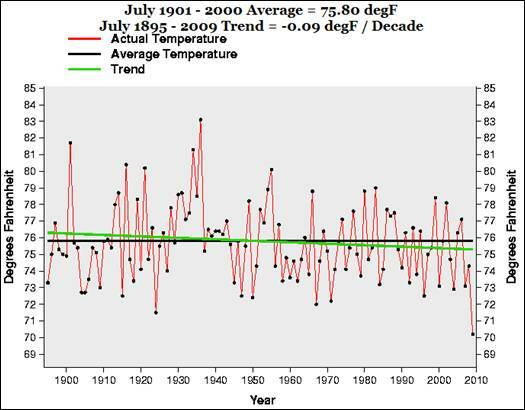 The following figure shows that July temperatures have been declining since the 1930s. 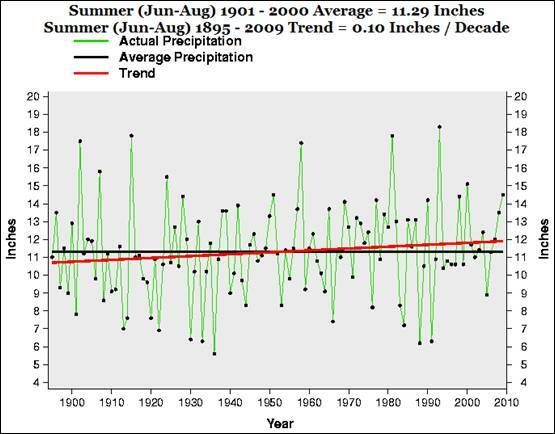 The following figures show the average summer temperature and summer precipitation for Illinois (plotted at the NOAA NCDC website: http://www.ncdc.noaa.gov/oa/climate/research/cag3/state.html). Neither trend is statistically significant. The figure includes a linear trend and confidence interval of the trend (0.019 +/- 0.061 deg./decade). 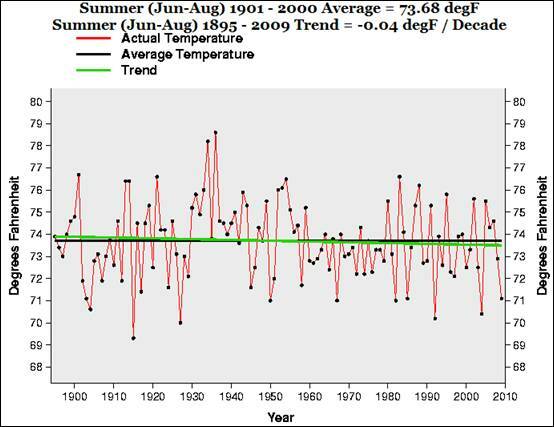 There is no statistically significant trend in annual average temperature. Stephen Chu says the “great agricultural machinery of the U.S. is at risk” due to global warming. 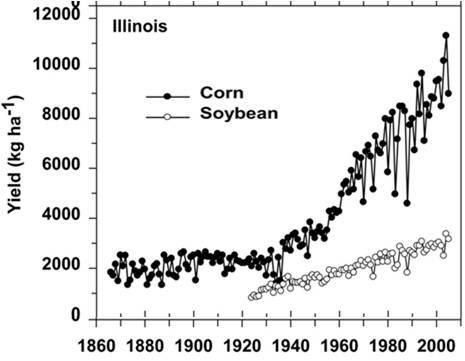 An Agronomy Journal report [http://agron.scijournals.org/cgi/content/full/100/Supplement_3/S-79] states: “The dramatic increases in corn yield that occurred since the founding of ASA in 1907 occurred almost entirely in the second half of the 20th century”. 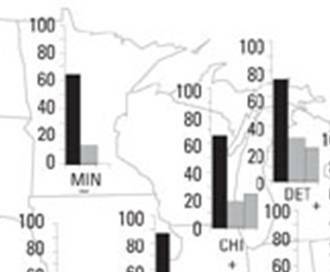 The following figure is from that report showing corn and soybean yields per acre for Illinois. Unlike Chu’s alarmist position, the data show the opposite trend. Steven Chu is out to lunch if he thinks somehow the above trends will suddenly change and it will warm by several degrees just because the climate models say so. 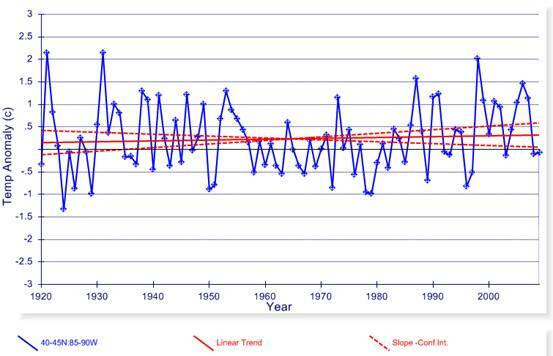 Holdren carefully selects his data in order to misrepresent the trends. Universities promoting alarmist scare stories when the data show the opposite – they have joined the alarmist propaganda team.